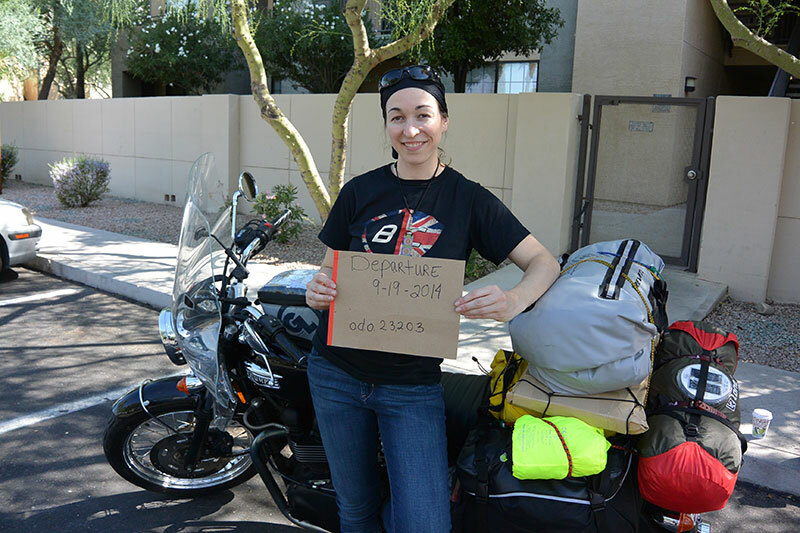 Danell is an American long distance motorcycle rider. Not only has she broken a world record, won many awards, penned a number of books, run dl-couture, a custom high fashion line which has dressed Mrs. World, Miss America, and more, she also continues her humanitarian work through her foundations Threading Hope and Highwire. 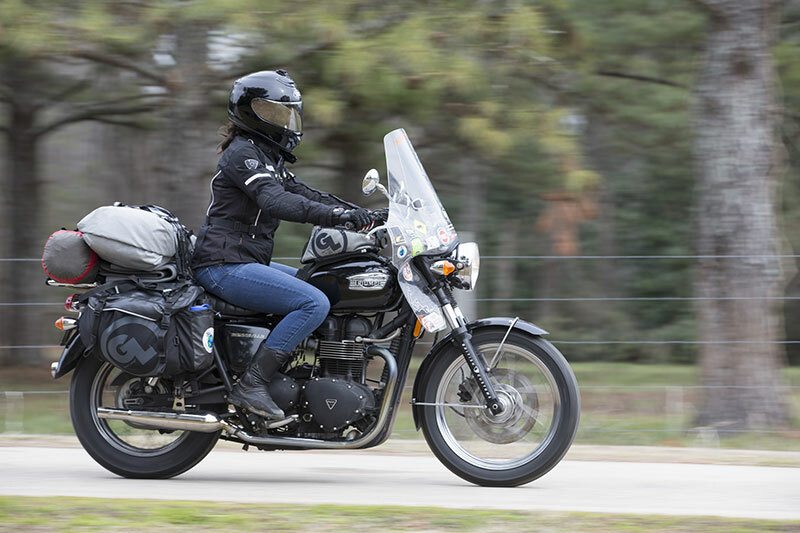 Danell is a woman of epic abilities who shares her story with the Motowitch Collective of travelling through all 50 States in the USA and through Canada on her trusty Triumph Bonneville, Amelia. 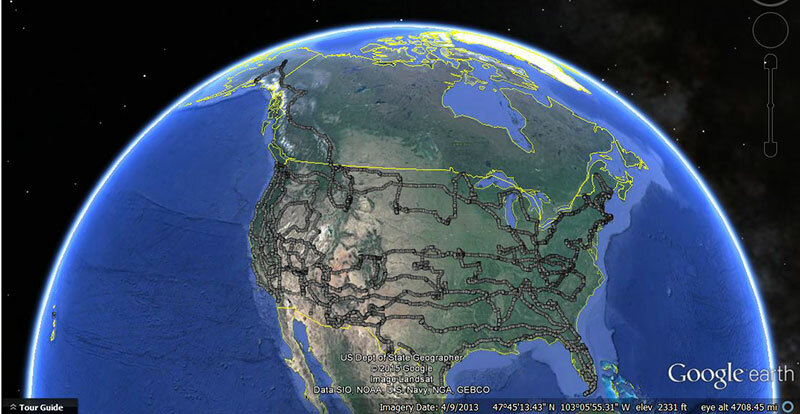 Armed with tank full of fuel and a case of Rand McNally maps I was ready to take on the back roads and scenic routes across the North America. Amelia-my 2006 Triumph Bonneville- was loaded! 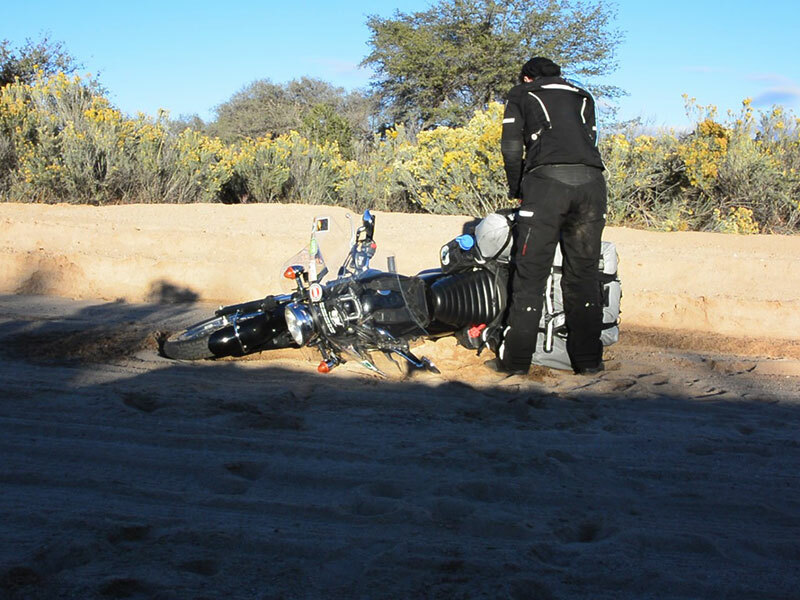 All my belongings for a year were packed into waterproof GiantLoop luggage, my home – a tent was strapped to the back…left leg in and now the right as I zipped on my REV’IT suit I exhaled – it was time! 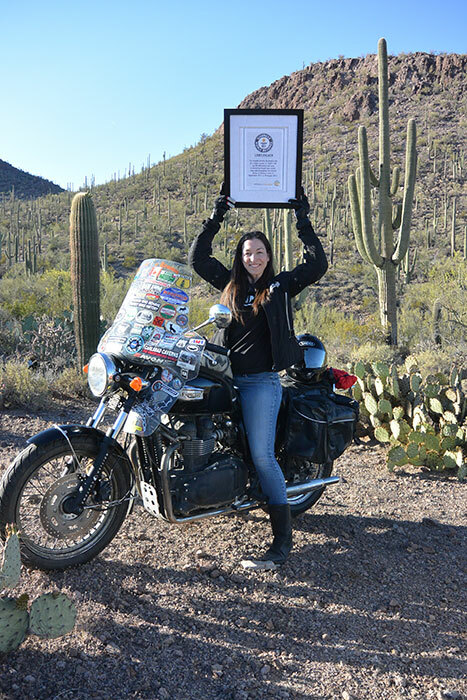 Guinness World Record – Longest Journey by Motorcycle in Single Country – Breaking the current record by almost 25,000 miles (24,839 to be exact), doubling the previous record…and GWR verified – I am the first solo woman motorcyclist to ever hold this record! I did not know my exact route as I departed, but I had personal goals I wanted to achieve and parks I wanted to see. One of those goals was to camp / to set up tent in every state – box checked! Much of my route was guided by visiting National Parks, both in the US and in Canada. I grew up camping at many of these as a child and it was wonderful to experience them again some 15 or 20 years later, as an adult and by motorbike. I enjoyed all types of camp life on the road – from my Lone-Rider Moto-Tent (my main house) to Yurts in Pennsylvania and Colorado, and KOA Kamp Kabins (graciously donated to me in a handful of states along the journey). From State Parks to wild camping, to privately owned sites, all had different appeals and experiences. Everyone I met along the road was kind, some stand out more than others…like the couples that provided me breakfast at campsites, or gave me extra fire wood. And then there are the “gas-station” gentlemen that would always venture in close with admiration as they thought I was riding a vintage Triumph, like the ones they used to ride. These gentlemen were usually in their 60’s or 70’s, and we would chat about bikes and adventure, and one even gave me a couple bucks to have a coffee on him, this after I removed my helmet and he gasp…”you’re a woman!” I just laughed and said, “yep!” We talked of travel, weather and the beauty of taking life on – full-throttle, living out adventure! From camping among the giant redwoods in California to swimming with the manatees in Florida, from crashing on the ice in New Mexico to out running severe storms in Missouri, from the Dalton highway in Alaska to deals gap in North Carolina … boredom never found its way into my journey! New sights and experiences flourished! Even things like bad weather led me in the direction of a new location and new memory! I can honestly say there was not a horrible event in my journey, as things going wrong challenged me and always led to amazing opportunities or meetings with wonderful people! If the weather was bad and re-routed me it always led to a unique experience I would not have had otherwise. Or even when I crashed at slow speeds on the ice, this gave me a chance to meet a driver coming around the corner to warn me about the blind curve ahead that hits steep downward hill with no guard rail and covered in sheet ice – I would take my mini-crash at 3 to 5 mph over the possibilities of that hill with speed any day. 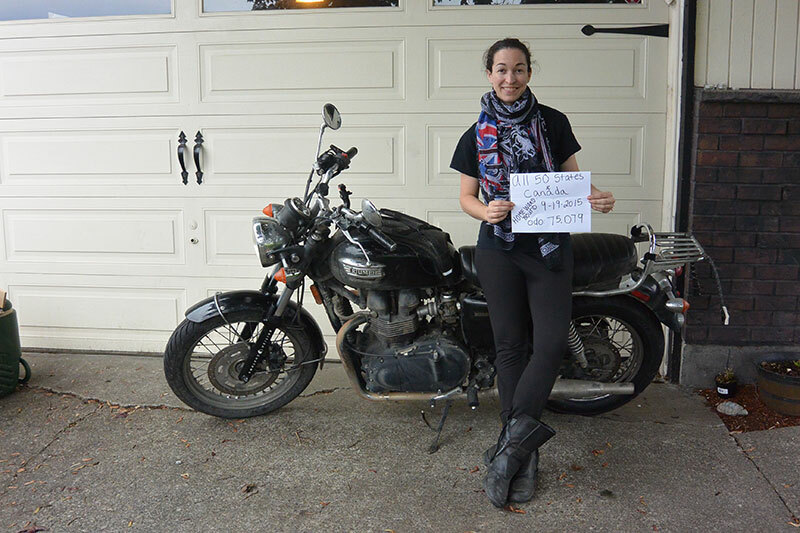 “When selecting my choice bike for such a trip I simply went to where my heart was and selected a 2006 Triumph Bonneville, named her Amelia, and took off to ride “around my native country and into Canada, ensuring a great experience and adventure! This was a solo journey but at times I did plan rides with others along the way. Some planned weeks in advance and some by happenstance. But all were cherished. I rode through Colorado, New Mexico and Arizona with my mom and dad, I rode many eastern states and deals gap with my uncle, I rode with new friends and motorcycle groups I met along the way. I enjoyed the community rides as there is a creative flow when surrounded by others who get the spirit of flight without leaving the ground…but I did cherish the times I rode alone (which I did for over 80% of my trip). I have traveled solo throughout the world and part of this experience was challenging myself and taking the time each day to just be alone with my thoughts and the silence of nature (or the loudness depending on where I ventured, like falling asleep to the insects in the south and waking up to birds in the north). Each month I documented in raw version of mini-documentary on my YouTube Channel. I have sights and sounds and the beauty that the open road holds. Enjoy the journey and ride free! 54,050 (including HI with limited edition Triumph rental bike).